1.) The original suspension bridge was built in 1889 but was rebuilt in 1903, replacing the hemp ropes with steel cables (thank you to whoever decided on that safety upgrade!) Since its earliest days, it's been one of the area's most famous attractions. 2.) Come around Christmastime and view the Christmas lights, the whole valley around the suspension bridge is bedecked with a dizzying display of lights which make the whole valley glow with festive cheer! Like everything else in Vancouver, Capilano Suspension Bridge Park was featured in an episode of "MacGyver" (it's the one where Mac builds a cannon out of a telescope, an air horn, grease, vinegar, pepper and bed stuffing). Also the episode of "Psych" which first featured Cary Elwes as the charming art thief Devereaux! 3.) Why call your park a "suspension bridge park" and only have ONE bridge in it, you ask? Well, clearly the board of trustees also asked themselves this question, which is probably why they decided in 2004 to give guests the 'squirrel's eye view' of the surrounding rainforest. They created a large treehouse and network of seven suspension bridges linking eight 'young' Douglas Fir trees (for reference, young is around 250 years old, since some of their fellows are over 750 years old!). It looks like the Ewok Village in Star Wars! At heights of up to 33.5 meters the real marvel of the platforms is the innovative 'tree collar' support that does not use bolts or nails that penetrate the Douglas Firs! Being so eco-friendly means that you can awaken your inner Ewok and dance like it's the end of The Return of the Jedi. As far as I can tell, visitors are not discouraged from singing the "Yub Nub, Eechaw Yub Nub!" song from that movie, so this is your chance to let loose. 4.) Who doesn't want to stand 91.44 meters in midair on a circular cantilevered walkway towering over the verdant Capilano Canyon? The newest bridge is just such a catwalk. Built in 2011, it gives access to parts of the park visitors could not reach before. What was once an inaccessible stretch of cliff faces and rainforests now can be viewed from above in all its splendour. Like bridges in other places, such as the Grand Canyon, many parts of the Cliffwalk have strengthened glass floors for those hikers and visitors not suffering severe acrophobia. You now have not one or two, but THREE amazing sites (and one special time of year) to visit in Capilano Suspension Bridge Park. Each experience will let you get in touch with nature in hitherto unexplored ways. Just up the river from the Capilano Suspension Bridge Park is the Capilano River Regional Park. Only a few miles' drive outside of bustling downtown Vancouver and you'll be transported to a peaceful, verdant paradise. There's also so much to do, be it hiking, biking, camping, kayaking... you name it, they've got it. The park begins where the Cleveland dam separates the enormous Capilano Lake from the lower river canyon. If you're in the mood for a low impact nature hike or bike ride, there is a circuitous 2.6km trail that begins and ends at Cleveland Dam. This 195-meter long, 92-metre high towering monolith of man's mastery over Mother Nature is the reason Capilano Lake even exists. And, the Cleveland Dam is famous. We're talking starred in episodes of "Supernatural" and "Smallville" famous, as well as being a frequent 'neutral ground' for clandestine meetings in Amazon's amazing series "The Man in High Castle." The iconic spillway of the dam cascading down to the valley below reminds one of Richard Kimble, "The Fugitive," standing off against Federal Marshal Gerard and saying "I didn't kill my wife!" The dam, as has been mentioned, created Capilano Lake, which provides most of the drinking water to Vancouver, and its surrounding natural beauty is breathtaking. There's a walkway across the top of the dam, and the dam itself acts as a centralized point for the regional park below, so take a picture, don't look down (unless you really want to) and enjoy. Do you like to raft or kayak? You can in the Capilano River Canyon and Capilano Lake. There are easy stretches for beginners all the way up to whitewater rapids for true "The River Wild" aficionados! Most of the trails begin at the Cleveland Dam, but there are access points to the river bed all over the place. The entire region is one massive rainforest, with all the density and biodiversity one would expect from such a place, and the river's surface offers a unique perspective to the whole viridescent spectacle from far below the canopy of trees and sheer rocky cliff walls. Most people have only witnessed salmon leaping majestically upstream over water cascades in the game Skyrim. Unfortunately, in 1954, the salmon population of the Capilano river was interrupted by the construction of the mighty Cleveland Dam. The good news is they built a big salmon hatchery right next to the river as a way of protecting the population of the delicious fishies. Families can visit at certain times of the year to see the fish grow from hatchlings through adolescence and adulthood along the glass-walled "fishway" where you can see the determined critters fighting against the current and leaping up towards their spawning ground. This is it. The Big One. Grouse Mountain stands like a great granite overseer above Northern Vancouver, and you can conquer its imposing granite facade if you are bold enough. It's not exactly Kilimanjaro, but it's still a hell of a climb. The trail known as the 'Grouse Mountain Grind" is a 2.6km hike/jog up the mountain to the summit and is known locally as "Nature's Stairmaster". The mountain in the autumn and winter is also host to the thriving skiing community. So gorgeous is the overlook on the mountain that the ski-tram and the surrounding mountainside have stood in for Geneva in an episode of MacGyver, obviously; and the Blue Ridge Mountains of Virginia in an episode of the X-Files. There's also an ice rink and a round observation room attached to a truly monumental 1.5-megawatt wind turbine right on the top of the mountain! This one is not actually in the Capilano Valley, but hear me out! Sometimes, the Suspension Bridge Park gets a bit crowded, and this can turn off some visitors. The Lynn Valley Park is one of those local 'best-kept secrets' that gives you options and alternatives. It's within 20 minutes of the Capilano Valley, it's free and it's basically just as gorgeous. The best part? The Lynn Valley Park sports its own pedestrian suspension bridge! Seriously, if you happen to want a bit of a more out-of-the-way alternative to the more popular attractions in the Capilano Valley, nearby Lynn Valley is where to go. There's no question that anyone enchanted by Capilano will enjoy Lynn Valley's 617 lush acres of trails, fields and swimming areas! There are two campgrounds at Capilano Regional Park, the Cleveland Dam Field for those who like to prefer the openness of nature, and Camp Capilano, a more family-oriented one with some cabins and a pool. Or hit up Capilano River RV Park, closer to downtown. FUN FACT: Since Vancouver was first founded, one of the primary advocates for the First Nations indigenous peoples was Joe Capilano of the Squamish. As such, Capilano is a name that pops up all over the place in North Vancouver. 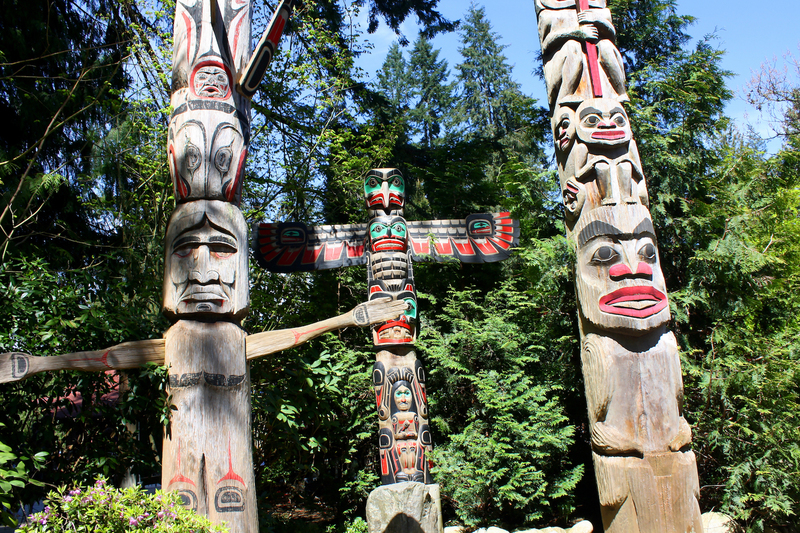 Fascination and respect for the native cultures are expressed in the Capilano Suspension Bridge Park at the Story Centre, home to one of the largest private collections of totem poles, each of which is carved to tell a story or history from one of the local tribes. The Story Centre is a great way to discover those tales. The Story Centre also pays homage to the original settlers and explorers and the builders of the iconic suspension bridge the park is named after.